Even so, Senate Democrats are—with increasing frequency—asking detailed questions about the religious views of President Donald Trump’s judicial and executive branch nominees, then citing their answers to oppose confirming them. For Republicans like Sen. Mike Lee (R-Utah), the Democrats are clearly and unconstitutionally applying a religious test. The issue became prominent during a 2017 Senate Judiciary Committee confirmation hearing for federal appeals court nominee Amy Barrett, then a Notre Dame law professor. All nine Democrats on the panel voted against Barrett’s confirmation, while all 11 Republicans voted for the nominee. She was subsequently confirmed by the full Senate on a 55–43 vote, with only three Democrats supporting Barrett. Kamala Harris (D-Calif.) pressed U.S. District Court nominee Peter Phipps about his membership in the Knights of Columbus, a social welfare service organization of more than 2 million Catholics. Growing tensions surrounding the Democrats’ tactic culminated earlier this month during a Feb. 7 judiciary committee exchange between Lee and Hirono that left the Utah senator miffed. “In what way, shape, or form is asking Naomi Rao whether she believes particular conduct to be sinful an appropriate question to be asked by this committee?” Lee asked Hirono. “I urge you to consider the fact that we should never expose someone to shame, ridicule, or scorn on the basis of their religious beliefs, and I ask that we refrain from doing so in this committee,” Lee said. Hirono denied Lee’s contention, arguing that it is appropriate to ask if a nominee’s “strongly held religious views” makes them unable to serve in an unbiased manner in a public office. “It is not that we ask do you think that such and such is a sin,” Hirono claimed. “That was asked this week, this week it was asked. I’m not making this up,” a clearly exasperated Lee declared. It is fair to ask if “someone can enforce or interpret the law irrespective of their faith,” but “that’s not what the Democrats have been doing,” Lee said. “Asking about the content of someone’s beliefs is not the same as asking whether they can honor his or her oath. I understand that the Democrats say they’re interested in whether a judicial nominee will be biased, but you don’t need to ask about a nominee’s view of sin in order to accomplish that aim,” he said. The issue raised by the Democrats’ actions, however, may not be as simple and straightforward as the wording of the Constitution, according to Walter Olson of the libertarian Cato Institute. 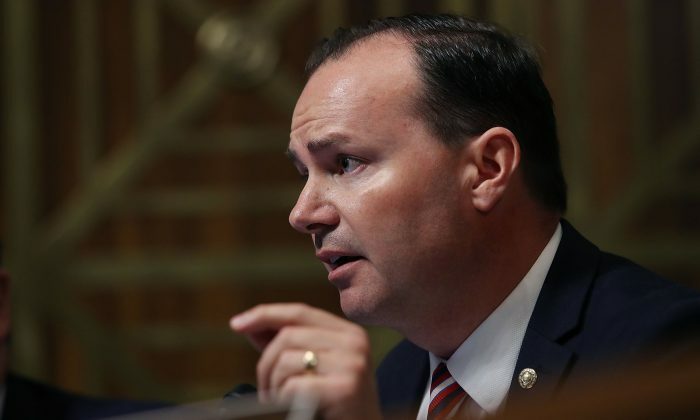 “It pains me to ever disagree with Sen. Mike Lee on a constitutional question because he’s one of my favorite senators, and he tends to be right more often than any of his colleagues in the Senate,” Olson told The Epoch Times. “The religious test clause of the Constitution has almost no applicability any more because it takes in a very narrow kind of government action,” Olson said. Olson is the founding editor of the overlawyered.com blog and author of multiple books on the U.S. legal system. The authors of the Constitution feared the kinds of religious tests for public office under the king that had been common in England for several centuries, Olson said. That’s the reason for Article VI, Clause 3. “What it has never done is prevent the consideration of religion, it’s not an anti-discrimination clause,” Olson said. Presidents throughout American history have considered religion in making appointments, such as for maintaining a certain balance on the Supreme Court or in a chief executive’s cabinet, he added. Still, Olson warned Senate Democrats against encouraging intolerance of religious diversity. “Where I am strongly with Lee and critical of Harris, Cory Booker, and the others is that America has worked as a religiously very diverse society because … we have a superstructure of self-restraint. Is Dianne Feinstein the True Manchurian Candidate?